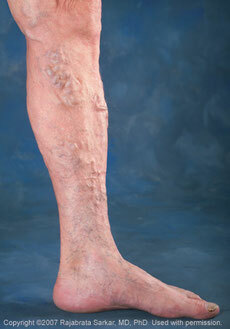 Spider veins, medically known as telangietasias are dilated capillary veins less than 2 mm. in diameter. They are small blue to red appearing blood vessels that lie close to the surface of the skin and occur either in lines or web-like patterns. They are usually visible on the legs but sometimes are visible around the nose and lips and are commonly referred to as "broken veins". While they can ache, burn or itch now and then, they are usually not symptomatic. Spider veins are not harmful and are simply unsightly.